The first pyramid (The Step Pyramid of Djoser built around 2600 BC – seen above) was originally surrounded by a 34 ft tall wall which had 15 doors in it. Only one of the doors opened. The women in ancient Egypt enjoyed legal and economical equality with men. Nevertheless, they never enjoyed social equality with men. Contrary to popular belief, excavated skeletons show that the pyramid builders were actually Egyptians who were most likely in the permanent employ of the pharaoh. Graffiti indicates that at least some of these workers took pride in their work, calling their teams “Friends of Khufu,” “Drunkards of Menkaure,” and so on—names indicating allegiances to pharaohs. When a body was mummified, its brain was removed through one of its nostrils and its intestines were also removed and placed in jars called canopic jars. Each organ was placed in its own jar. The only internal organ that was not removed was the heart, because Egyptians considered it to be the seat of the soul. Ramses the Great had 8 official wives and nearly 100 concubines. He was over 90 years old when he died in 1212 BC. Egypt is officially known as the Arab Republic of Egypt. 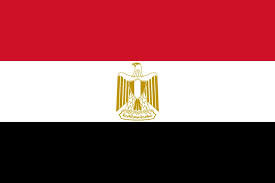 In 2012, the population of Egypt was just over 83 million (83,688,164). Egypt is bordered by the Gaza Strip, Israel, Libya and Sudan as well as the Mediterranean Sea and the Red Sea. The Sinai Peninsula in Egypt spans across two continents, Africa and Asia. Mount Catherine is the highest mountain in Egypt, standing 2,629m high (8625 ft). The official language of Egypt is Arabic, but others languages such as English and French are also understood by many. A Pharaoh never let his hair be seen – he would always wear a crown or a headdress called a nemes (the striped cloth headdress made famous by Tutankhamen’s golden mask (pictured above). In order to deter flies from landing on him, Pepi II of Egypt always kept several naked slaves nearby whose bodies were smeared with honey. Egyptian’s believed that the earth was flat and round (like a pancake) and that the Nile flowed through the center of it. Egyptian soldiers were used as an internal police force. Additionally, they collected taxes for the Pharaoh. In every temple in ancient Egypt the pharaoh was supposed to carry out the duties of the high priests, but his place was usually taken by the chief priest. Both Egyptian men and women wore makeup – eyepaint was usually green (made from copper) or black (made from lead). The Egyptians believed that the makeup had healing power. Originally the makeup was used as a protection from the sun – rather than for adornment. While the use of antibiotics did not begin in the 20th century, early folk medicine included the use of mouldy foods or soil for infections. In ancient Egypt, for example, infections were treated with mouldy bread. Egyptian children wore no clothing at all until they were in their teens. The temperature in Egypt made it unnecessary. Adult men wore skirts while women wore dresses. The capital city is Cairo, which also has the largest population. Other major cities include Alexandria and Giza. Egypt is a very dry country. The Sahara and Libyan Desert make up most of the area of Egypt. Egypt experiences natural hazards such as droughts, earthquakes, flash floods, landslides, windstorms (called khamsin), dust storms and sandstorms. The longest river in the world, the Nile, runs through Egypt. Egypt is famous for its ancient civilization, the Ancient Egyptians, who date back to around 3150 B.C. Egypt is home the Great Pyramid of Giza, one of the Seven Wonders of the Ancient World. The most popular sport in Egypt is football (soccer). For more information, check out maps of Egypt or take a closer look at the Egyptian flag. Rich Egyptians wore wigs while the other classes would wear their hair long or in pig tails. Until 12, Egyptian boys had their heads shaved except for one plaited lock – this was as a protection against lice and fleas. It is not known who destroyed the nose of the Sphinx (pictured above). There are sketches of the Sphinx without a nose in 1737, over 60 years before Napoleon reached Egypt and hundreds of years before the British and German armies of the two World Wars. The only person known to have damaged it was an Islamic cleric, Sa’im al-dahr, who was lynched in 1378 for vandalism.